For you readers of my blog from America or from Western Europe, consider yourself fortunate that the type of Food and Wine you are viewing above is readily available to you and most of all it is something you can afford. I just came back from an Amazing experience in the city of Kiev in Ukraine. The people are wonderful, hard working people who have a very rough life. For a New York born and raised man now living for the last 25 years in South Florida I consider myself spoiled after witnessing the struggles of an Eastern European lifestyle. I must admit this would not be the spot I would normally pick for a 5 day vacation. I went for a purpose. I went to meet a beautiful woman named Viktoria who I have been communicating on Skype with for 4 months and decided to meet her in reality. 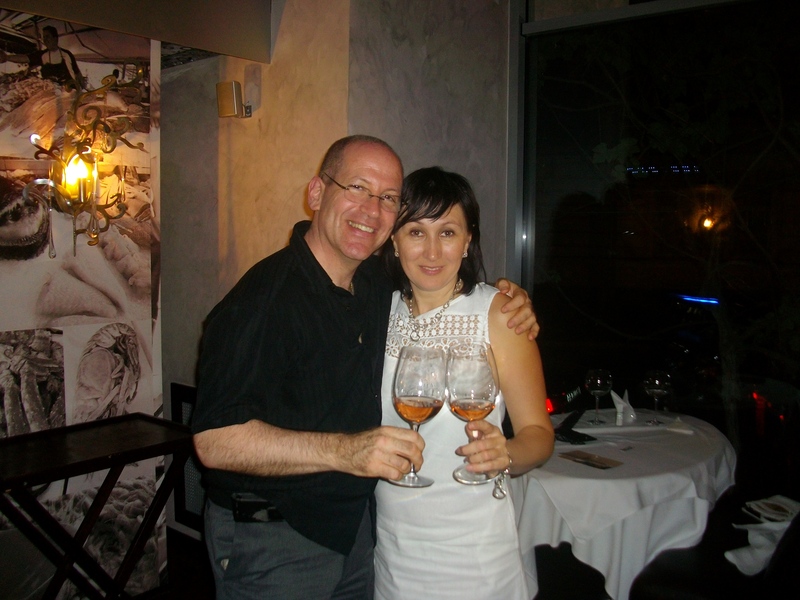 As a gentleman, I wanted to introduce Viki to new foods and new wines she had never experienced. I thought this would be a problem when I arrived as locals considered my idea of spending $6.00 on a Bottle Of Evian very very expensive. For a Ukrainian this might be. I was surprised after doing some research on the internet that for visitors to this very poor but beautiful city of Kiev, there is a variety of classic Ukraine dishes of Borscht and Blintchki but there are also 4 star restaurants featuring USDA Prime Steaks, Fine Dining Italian, Fresh Fish from all over the world and Asian Cuisine. 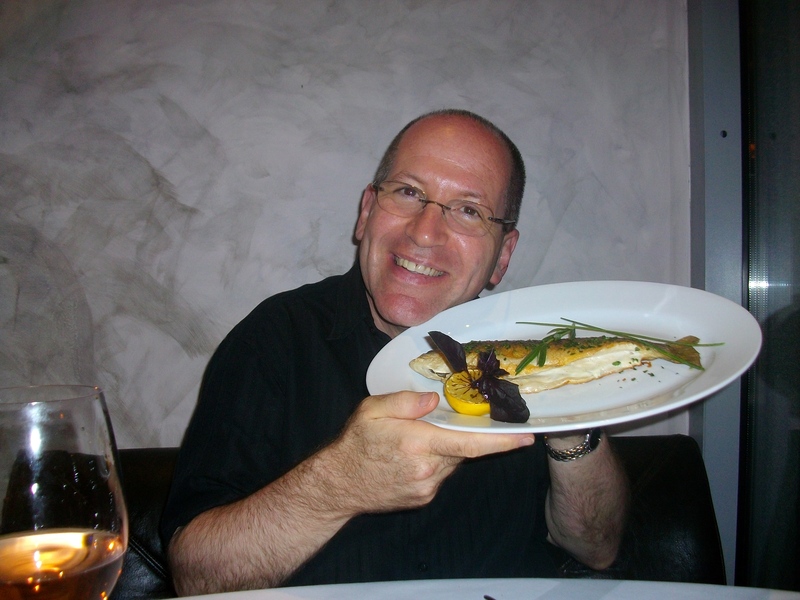 In the middle of Kiev, Ukraine we dined on Insalata Caprese, Salmon Carpaccio Antipasti. For the main course, I ordered Homemade Pappardelle with a Frutti Di Mare Sauce (Clams, Mussels, Shrimp, Squid) fresh tomatoes. The Pasta was Al Dente. Viki had Fresh Salmon that was served with a marscapone based sauce. Navigating Wine Lists in Kiev can be tricky as there are some very well known wines that are way overpriced such as Zenato Amarone and Brunellos but if you look carefully you can find a solid bottle of Nero D’avola from Sicily which Sommelier Andrey Kornour thought would be a nice pairing. 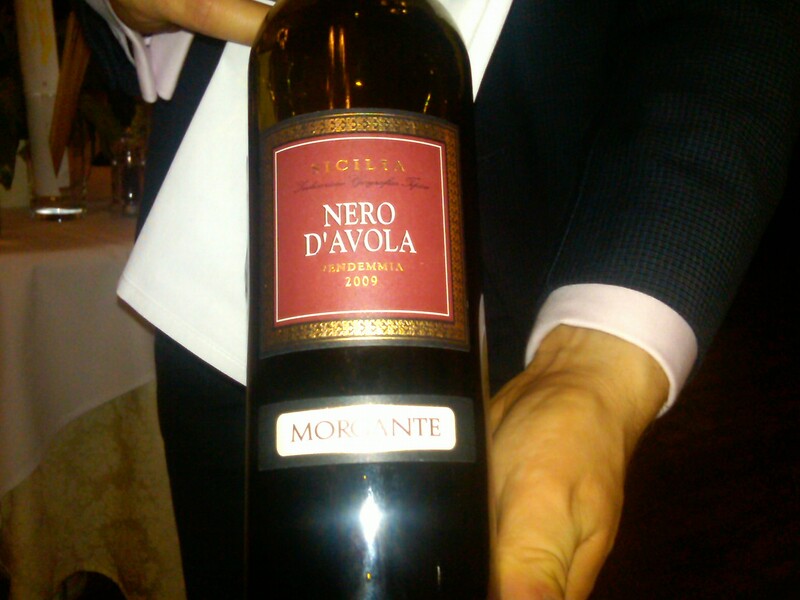 $50.00 for the Nero and it had nice cherry fruits with hints of red licorice and a little black pepper spices. I instructed Viki to save some wine for Dessert and introduce her to chocolate and Red Wine. I ordered a Warm Chocolate Cake and Viki had her favorite Tiramisu. 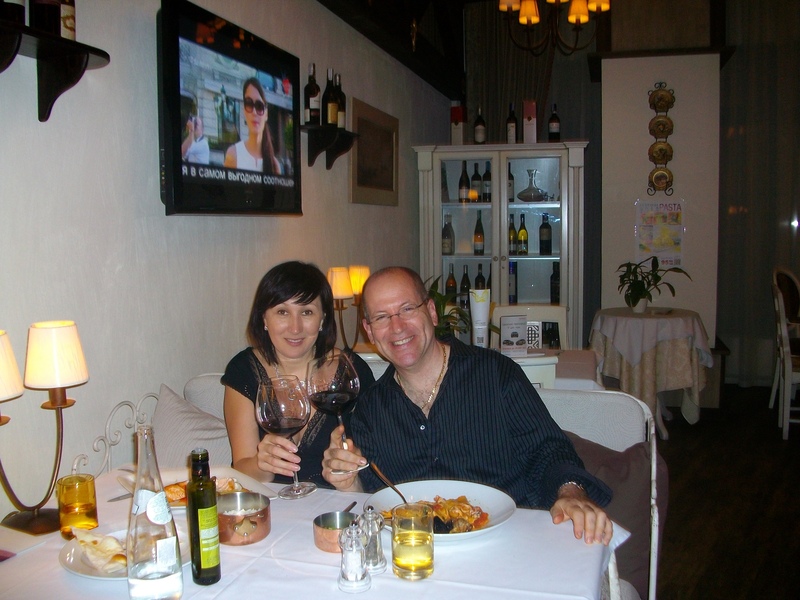 As you can see we both look happy with this authentic Italian Ristorante we found in the Ukraine for a total bill of $150 including the Wine! Our last night, I was in the mood for really fresh fish. Although the Ukraine is not known for it’s fishing ports, they bring in really top of the line fresh fish from Finland, Norway, Ireland, Holland, Italy etc. The Fish Market Restaurant is top notch in my book. I like Fish Restaurants that show you the Whole Fish on Ice First before preparing the Fish. Who would think you can find this in a Country that people think a $6.00 taxi ride is a luxury instead of walking? Arugula Salad with Grilled Tiger Prawns and Shaved Grana Padano Cheese for starters. Potato Blintchki with Salmon Caviar and Sour Cream with Dill. For Fresh Fish, perfectly cooked Whole Dorado Fish for Viki and Whole Grilled Artic Char for me. Roasted New Potatoes and Viki’s first taste of Creamed Spinach with Pine Nuts as a side order. For Wine once again, you could make a really bad mistake and spend way too much money. 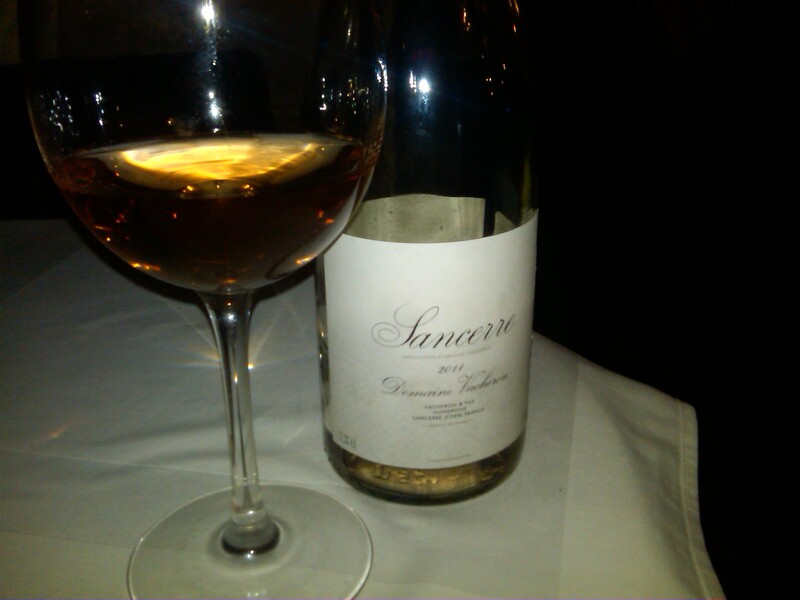 I found a slightly overpriced Sancerre Rose for $90.00 made from 100% Pinot Noir. The wine had perfect acidity, cherry, red currants and a hint of grapefruit. After 5 days Viki was getting her swirling technique perfected and she started to learn how to pick out the flavors of wine. It was a delicious summertime match with the fresh fish off the grill. I normally bring my own wine to Restaurants in America and Pay the Corkage fee however a great meal like this from Soup To Nuts with Wine $250 is a steal for people from Western Europe and America. I would also thank you for how nice you describe Kiev and hard working Ukrainian people. Good advertising for my country! PreviousPinot Gris/Pinot Grigio. Same Grape, Different Taste! NextI Like ‘Em FRESH, And YOUNG….White Wines That Is!